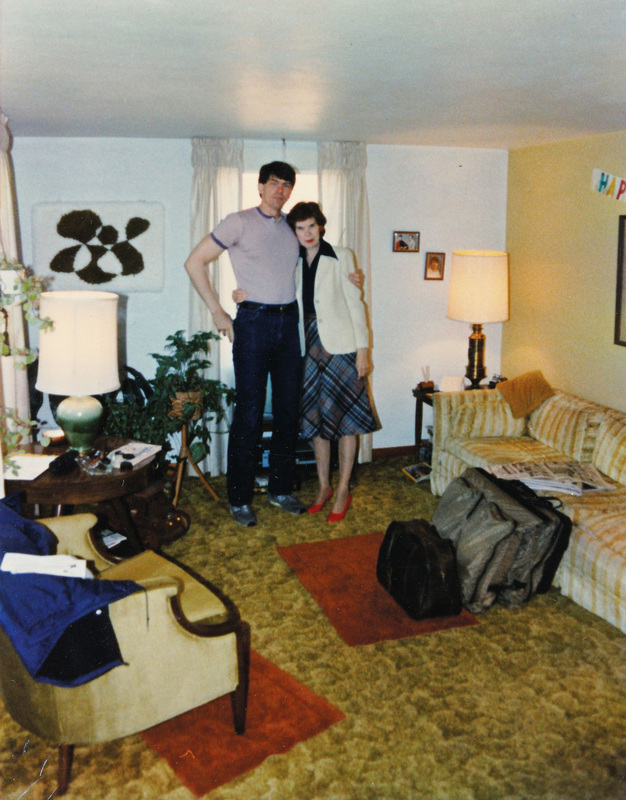 One morning in mid-1980, Jenette Kahn called and asked me to lunch to discuss an idea she had. In those days, I usually came to work wearing a sport coat with an open-collar shirt. When I knew I was going to have civilian visitors (“civilian” means non-comics people, in case any of you civilians out there don’t know) or there was a business meeting on the docket I wore a tie. Sometimes a suit. This particular warm, sunny day however, I had come to work with no tie, no jacket. Nice clothes, presentable enough. Like what we used to call “school clothes” back in the sixties. Anyway…I met Jenette at the restaurant she suggested, a place only a few blocks from 575 Madison where Marvel’s offices were and near 75 Rockefeller Plaza where DC was located. They wouldn’t allow me in! Jacket and tie required. They actually had a few loaner ties and jackets for barbarians like me, but, wouldn’t you know it, no jacket even close to a 48 extra-long. So, we went elsewhere. Another nice place, not quite as snooty. 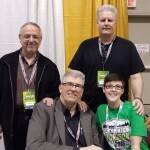 We talked about various things, the business in general and our common goal of bringing comics back to the forefront of American entertainment media. Jenette was all in favor of the two big companies being friendly and cooperative. I didn’t mention the fact that many DC-ers came over to our place after work to hang out and socialize, but I did mention that if the weather was decent, Marvel and DC people would usually meet in Central Park after work to play volleyball. She didn’t know that. I also mentioned that we had a publisher’s league softball team and wondered why DC didn’t. She said they might put together a team, if only just to play us in a “Championship of Comics” game. More on that later. Finally, we got to the main subject. Jenette brought up the first Marvel/DC crossover, Superman vs. the Amazing Spider-Man, published in 1976, which she thought was a wonderful idea. Why not do it again? We talked about who might be the stars. On the DC side, the leading candidates were Batman, Teen Titans and the Justice League of America. On our side, the Hulk, X-Men and Avengers. Jenette proposed doing one each year. I agreed. That way, we could eventually feature and gain exposure for lesser-selling but great characters like, on their side, Wonder Woman, Green Lantern, the Flash, the Legion of Super-Heroes and more. On our side, Thor, Captain America, Iron Man, the Fantastic Four and more. I suggested that if it was going to be a series, we ought to relaunch it with a second book starring our headliners, Superman and Spider-Man. The deal was simple, and we agreed on the key points right there. The companies would take turns producing the books. The non-producing company for each would have editorial approval. After costs, all revenues would be split 50/50. For some reason we decided that Marvel should produce the first one, Superman and Spider-Man. I went back to the office, wrote a budget and a deal memo and walked the proposal through the vetting process. The sales and accounting people estimated that Superman and Spider-Man would add $300,000 to the bottom line. Not bad in those days. President Jim Galton was thrilled. Our business affairs people called DC to confirm and codify. DC was already drafting the contract. Joe Orlando was to be DC’s editorial representative for approvals. I picked Marv Wolfman to write it, John Buscema to draw it and Joe Sinnott to ink it. I intended to supervise on our side. P.S. For the rest of my time at Marvel, every single day I wore a jacket and a tie to work. Big UPS for Jim starting it all!!! I was really partial to X-Men and Teen Titans. My mom bought that for me for my birthday and it was the great work of Walt Simonson and Terry Austin that just made me gush. And it was that singular work that got me into the industry. And when I finally met Walt, and he called me "son", it was the greatest day if my comic artist life. That and it was just a doggone great book! While reading DC's October 2011 solicitations, I was pleased to see Jim's last DC story prior to Marvel Treasury Edition #28 will be reprinted next year on March 21st. Legion of Super-Heroes Archives Vol. 13 HC will collect Superboy and the Legion of Super-Heroes #224-233. So the first story included is "When Stargrave Strikes" which went on sale November 15, 1976. It's nice to know Jim's complete Legion run will finally be available in hardcover format. This book was the best crossover of all of them. Loved the Shooter dialogue and the Buscema art. Superman certainly had a higher Q-score than Spider-Man, meaning that more people in general were familiar with Superman. Amazing Spider-Man, however, was outselling Superman better than two to one. The main reasons Superman's name came first is because I thought "Superman and Spider-Man" had a better ring to it and out of respect to the first comics super hero. The DC/Marvel listing paralleled the character logos. We knew DC's sales pretty well. Sources at World Color Press gave us their print orders and draws (numbers of copies printed for newsstand distribution), the ID Wholesalers gave us their sales reports (newsstand sell-throughs) as well as our own and direct sales numbers were easily accessible. That's interesting that Marvel published "Superman and Spider-Man" with "Superman" being the first name. I just remember in the mid-90's, (since I'm still a relatively young lad in the comic-world) when "DC vs. Marvel" came out, DC published it and made THEIR name first because, well, they published it. However, I would love to know why Marvel would have decided "Superman" was first over Spider-Man. Did Superman have better sales than Spider-Man at the time? Did Marvel want to give DC a break? Did you learn any interesting tidbits about DC's sales when launching the title? I cannot forget to mention that in the cover shown above, it is "DC" THEN "Marvel" presents. How did it work out for Marvel to have the second name listed? And as always, thank you for this incredible look into the comic world. I'm absolutely loving it and am greatly awed by your stories. I'll bet the selection of the Parasite was a sentimental choice, since Jim created the character back in the 60's. I like the Parasite character (since his appearance in the 90's Superman Animated series), but I am totally scratching my head as to why he was chosen to team up with Doom. Brainiac or any number of smarty pants Superman villains would seem like a more apt choice. Any tidbits about the reasons for choosing Parasite to represent the Rogues Gallery? czeskleba – I do agree that it is sad that Dave Cockrum didn't get to do LSH/X-Men, but the gorgeous Simonson and Austin art job on the X-Men/Teen Titans book definitely helped make up for it. Aha! czeskleba to the rescue! I remembered correctly that TT was among the first, but not that it wasn't originally planned that way. Sorry. Thanks. Marc, that photo was taken at my parents house in Pittsburgh. No reason for a jacket and tie. The first Marvel/DC crossover was the Wizard of Oz. 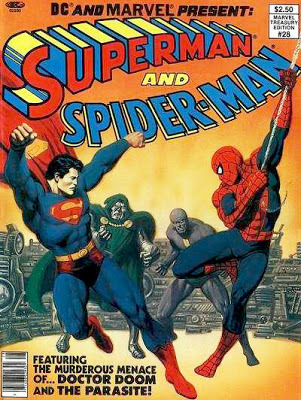 The second was Superman vs. Spider-Man. I wasn't there for those. They were one-shot deals. I don't know why the companies didn't continue doing them. The fact that the entire industry was in steep decline moght have had something to do with it. Management changes might also have been part of it. I don't know. Anybody out there have the scoop? You are correct, Teen Titans was selected later — after Marv and George created it. : ) Obviously, Jenette and I didn't discuss it at that lunch, but I knew it was one of the first three and that stuck in my head. Now I wonder what DC group besides JLA we did discuss. LSH? I think I'd remember that. What else was around then? Marc, I bet Jim is misremembering about the Teen Titans being discussed at such an early juncture. According to Dave Cockrum, the original plan was for the third crossover to feature the Legion and the X-Men, and he was supposed to draw it. But the growing popularity of the Titans at that point (late 1981) caused them to change plans and switch to the Titans instead. Dave dropped out of the project because the Legion was no longer involved, which was a tragedy. I'm a huge Cockrum fan, and seeing him doing a crossover of the two series with which he was most closely identified would have been an absolute dream come true. As a kid I was so excited about these crossovers. Though a Marvel child, I also loved the DC characters (my folks sometimes brought stacks of comics back from the Torrance swap meet that would include some of everything, but the comics I spent my own money on were exclusively Marvel). Seeing these two beloved heroes together was almost more than my young mind could handle. In one of these giant comics (I think I still have it), Superman punches Spidey and pulls back at the last moment…but the air pressure from the blow was still enought to send Spider Man sailing across the New York skyline. To me that was the single greatest moment in comics up to that point. As an aside, for around three years I've had a blog going about role playing games, and my return to that hobby after many years off. I was getting kind of tired of it (the gaming scene in general) and was going to abandon the blog, but after discovering yours and relighting my old love of comics, I've decided to keep it going and make it more about my pop culture love in general. Thanks for that inspiration Jim, and I'm sure your future posts will set off more comic book nostalgia goodness in me to post more about that aspect of my overall lifelong geekery! I always thought of you as wearing a suit and tie which is why this photo surprised me. Now I've learned the secret origin of that outfit! And I'll have to picture you more casually at work pre-1980. I didn't know restaurants offered loaner ties and jackets. I guess I've lucked out and worn a suit whenever I had to. Do you know why there were no crossovers for four years after the first Superman vs. the Amazing Spider-Man? $300,000 in 1980 is equivalent to $780,000 in 2010. What comic makes that kind of money nowadays? "Gaines runs MAD on his own terms and would like to run the rest of his life the same way. Shortly after the magazine moved into its present offices at 485 MADison Avenue, he toddled down for a chat with the manager of the building's restaurant, Morgen's East. "'Okay,' Gaines said, and left, crossing the place off his list. Several years later, the restaurant lifted its ban and allowed guests to dine tieless. If Morgen's East thought Gaines would now become a patron, Morgen's East was mistaken. 'There is no way I will ever set foot in the place,' he says. This is, in some ways, a pity, because Gaines likes comfort and convenience in his life, and the restaurant offers both. But, as he says, 'There are some things you can't forgive.'"